African finance ministers and governors of Sub-Saharan Africa have agreed to partner with the International Monetary Fund (IMF) on major needs of the region. Notice of the partnership was contained in a document tagged: 'Maputo Joint Declaration' released after the meeting of the group at the Africa Rising Conference on Friday in Maputo. The Declaration stated that African ministers and governors and the IMF managing director had agreed to further strengthen the partnership between the Fund and its African membership. It said also that they agreed to respond to the evolving needs of the sub-continent, it added. According to the joint declaration, policy dialogue and capacity building will reflect the ambitious agenda aimed at upholding macro-economic agenda with policy action. The action, it said, was designed to foster structural transformation and sustain strong and inclusive growth and overcome fragility in the system. It noted that the partnership would also take into account the different needs of African membership, especially countries facing challenges of fragility and conflict. The group and IMF boss agreed that it was imperative to address the infrastructure gap in Africa, adding that funding it required innovative approach. 'The ongoing reform of the IMF debt limits policy should seek to provide countries with enhanced flexibility in programme design to utilise a wider range of financing option,' it said. It said that strong institutions and continuous development of human capital were critical to successful economic and social development. It added that the group and the Fund had agreed to collaborate in the areas of training and technical assistance. 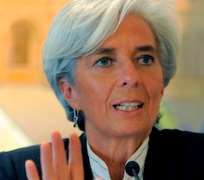 'They called on IMF to further step up efforts to draw lessons from successful experiences within and outside Africa,' it said.